I originally only planned to stay one night in Gainesville but when my hosts Nicole and Jack said it was ok to stop longer I jumped at the chance. 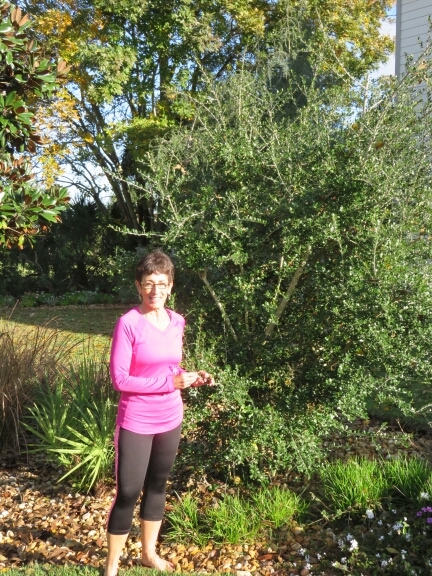 I’d done seven days straight from New Orleans and was happy to give my muscles a chance to rest. 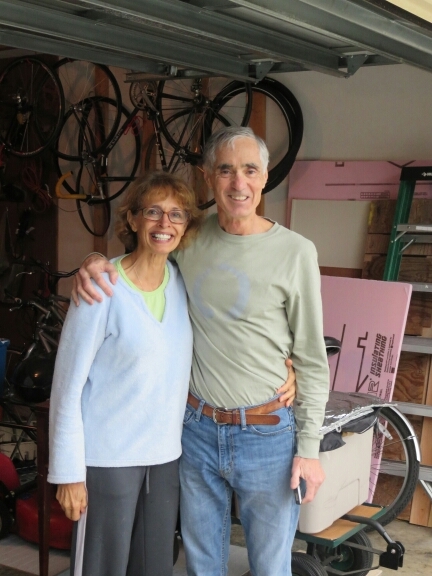 I spent a nice day in Gainesville, Jack explained a lot about the vegan no fat diet he was following and while I wouldn’t perhaps switch to it, speaking with him made me think about some of my dietary choices. Even with the amount of activity I engage in every day it’s still not a good idea to eat too much unhealthy food. I like cakes a lot and should perhaps reduce my intake from several honey buns a day to just one or none. 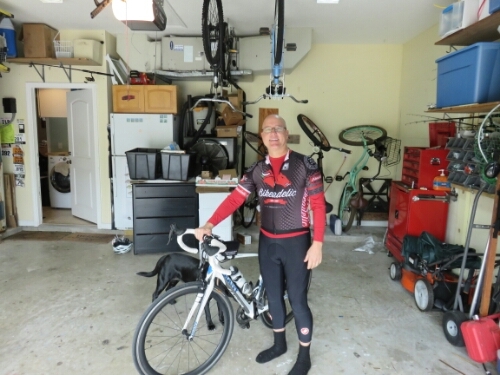 From Gainesville I was now heading to Saint Augustine on the Atlantic coast and I was planning on being there that day and effectively finishing my ride across the USA. First I had a few miles to contend with and these started badly as my rear hub was making a terrible noise. I’ve been having issues with it since eastern California and it keeps me nervous! Luckily the noise abated after a few hours and I stopped worrying. It was a pleasant day’s ride and a lot of it was spent riding on beautiful trails away from the main roads. Passing through one town a man came over and spoke to me as I took a breather and after asking about my trip was kind enough to pass me his details and those of his friends in case I needed any help further into Florida. As I left the same town a lady was kind enough to stop and check if I had somewhere to stay that evening. Like everywhere else in the world I was still amazed by the kindness of strangers. 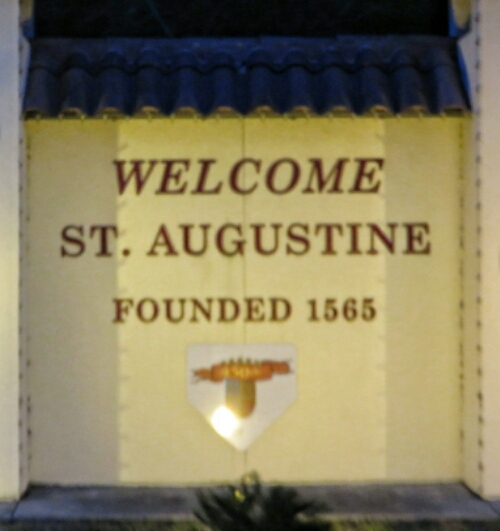 I reached Saint Augustine, the USA’s oldest city, as night was falling so I headed straight to my host Hugh’s place. Hugh was a lot of fun and I enjoyed talking with him. He had a lot of interesting things to say about homeopathy and especially using it on plants. I guess if it can work on humans then there shouldn’t be a reason it can’t work in the garden! 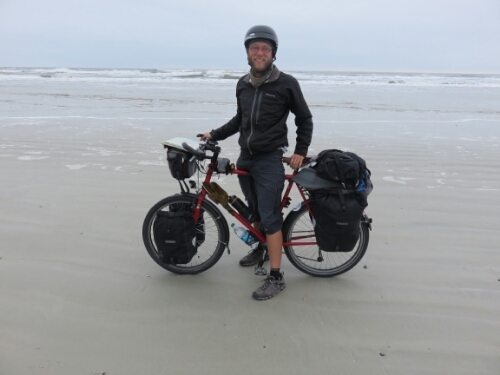 As I had arrived in the city as it was getting dark and as Hugh didn’t live by the beach I didn’t quite reach the end of my ride across the USA that day. Instead the next morning I set off into Saint Augustine to complete it. As the USA’s oldest city Saint Augustine is a tourist draw and a lot of the older buildings have been restored so that it is a very pretty place with a different feel to most of the other cities in America I have ridden through. 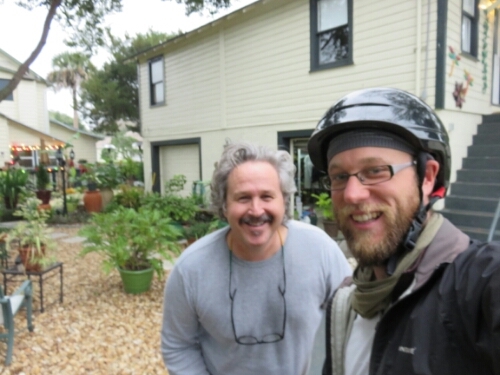 As I rode out of Saint Augustine, onto Anastasia Island, I was joined by Sloan who was heading home by bicycle himself and we had a nice chat as we went along. As we neared his place Sloan was kind enough to invite me for a snack and something to drink. He was considering taking a tour himself and I really hope he finds the time to do it! Sloan and I had been riding along close to the ocean while we had been talking and after I left his place I saw an entry onto the beach proper. I decided I may as well get right to the edge of the states, so headed down towards the sea. The sand was so well packed I was able to ride for a mile or three right by the ocean. The rest of the morning and early afternoon were pleasant as I cruised down the coast with a great tailwind. The I reached Daytona, the home of NASCAR and the rain set in. It was a touch miserable and I made my way along to New Smyrna Beach hoping the weather wouldn’t last. 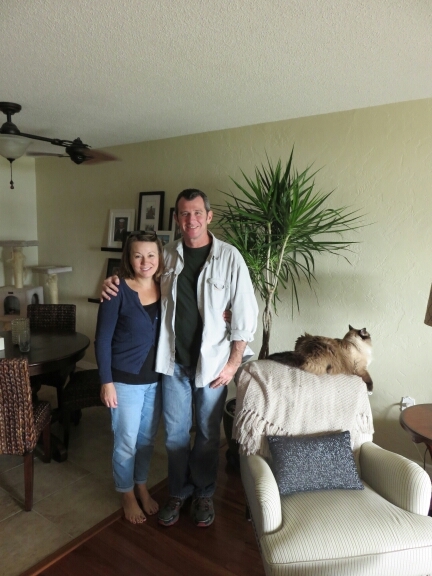 In New Smyrna I was hosted by Harris and Debbie who made me feel really welcome. They were a very interesting couple and Harris took the time to check my rear hub which made me feel a lot more confident in it. Harris was interested in a native American drink called Cassina that can be brewed from the leaves of a local holly bush. The drink has a long history of having medicinal properties and it was fascinating to learn what Harris had researched about it. 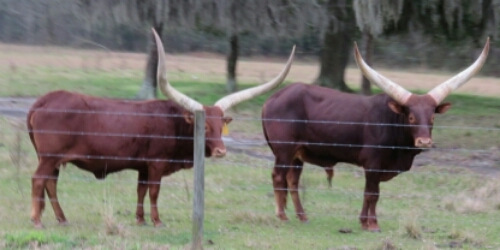 The following day I took Harris and Debbie’s advice and rode into the Merritt Island National Wildlife Reserve. This was a really beautiful area, that remained relatively untouched. 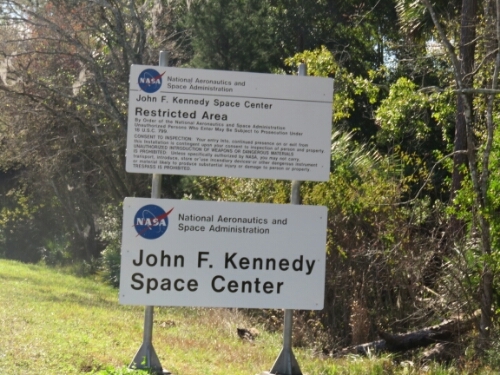 In part this was because the land belonged to the Kennedy Space Centre. 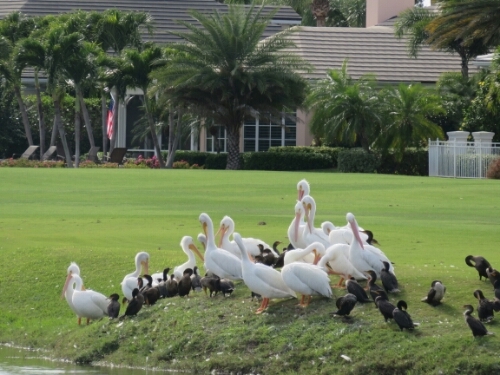 As a wildlife reserve, as you might expect, it was chock full of wildlife. There were hundreds of different species of bird. About three of which I know the name of. There were lots of impressive ones swooping about, meaning I now have a lot of photos of blue sky where I inaccurately tracked them as I tried to take a picture. I caught this one, no idea what it is though! 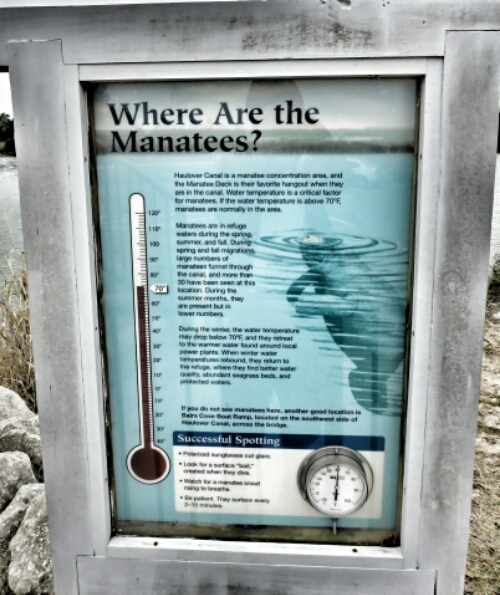 Apparently the reserve is a good area to spot manatees and I was very hopeful of seeing some of my first. Unfortunately it turned out that it was a bit chilly for them and I didn’t have any luck. Happily I got to see my first examples of some other creatures. 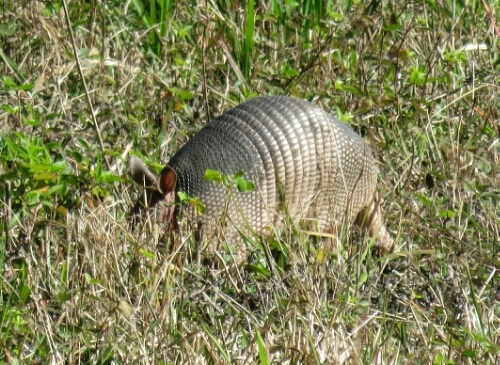 An armadillo for instance. This wasn’t strictly the first armadillo I had seen. It was rather the first one I had seen that wasn’t shaped like a pancake. It was good to know they come in 3D as well as 2D. 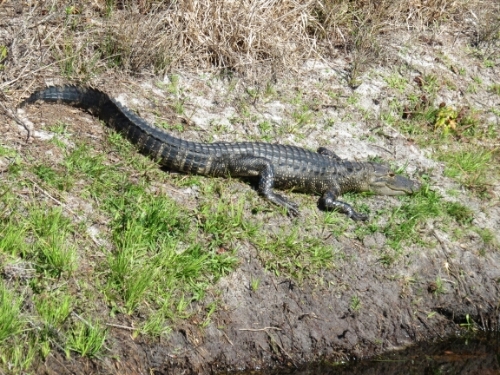 Later I also saw my first alligator which was exciting, even if it was a bit smaller than I had imagined. 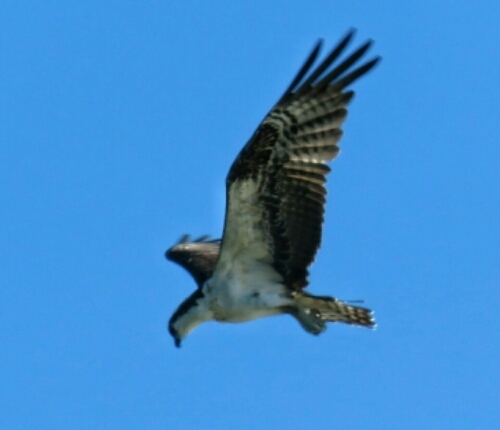 Once I’d finished pootling around the reserve I headed back off Merritt island towards Titusville on the mainland. 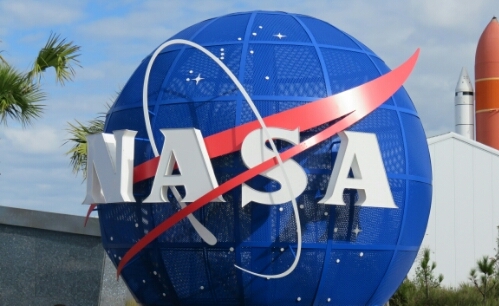 Titusville has apparently been suffering since the NASA shuttle programme ended. It still looked pretty bustling to me and I headed through to my Warmshowers.org host: Rich’s place. I was at the beginning. It was quite a few days into the trip before I was happy riding without knowing where I was going to sleep that night. 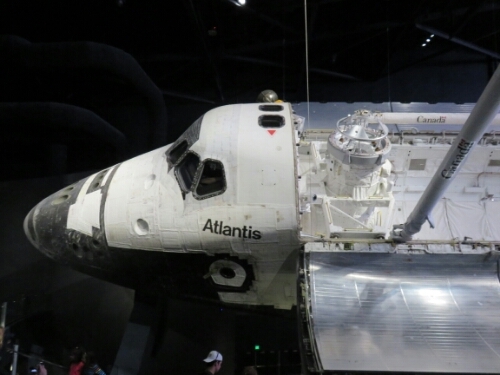 The next day I decided to visit the Kennedy Space Centre as I had heard a lot of good things about it. I’m really glad that I did, it was a pretty special experience. Even though it is only a few decades old it still drips with some of the most important history regarding some of the most spectacular endeavours of the human race. 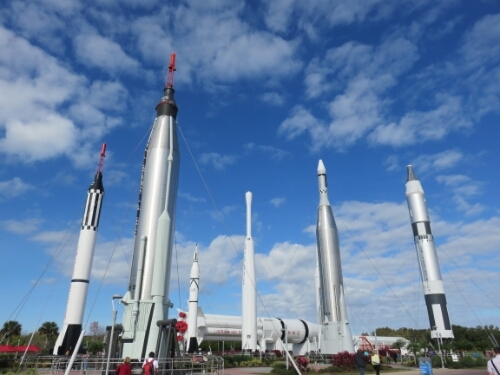 I got to see a Space Shuttle, a garden of rockets, launch pads and to touch moon rock. It was a bit like being a kid again. 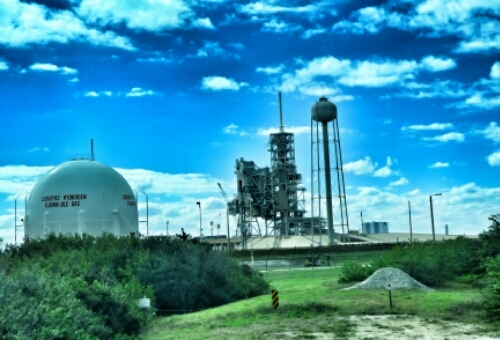 So much there was over scale, like the massive Crawler Transporters used to transport a shuttle and its huge rockets from where it was assembled to the launch pad. 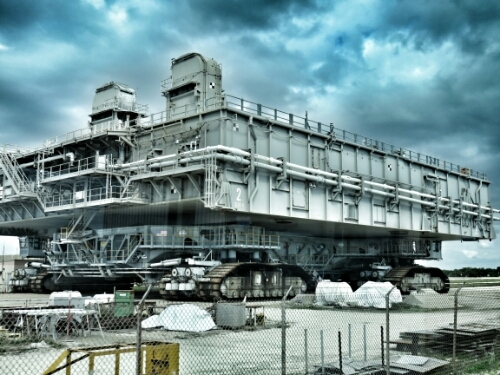 Each crawler weighs a staggering 2.7 million kg and they are the size of large buildings. When loaded they only move at 1.6kph. 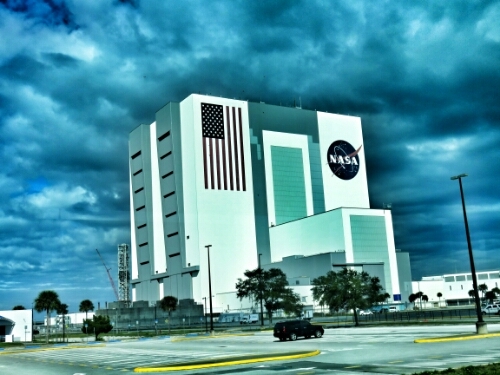 The building that the crawler was going to and from was the Vehicle Assembly Building, which was the largest building in the world when it was built and is still one of the largest. 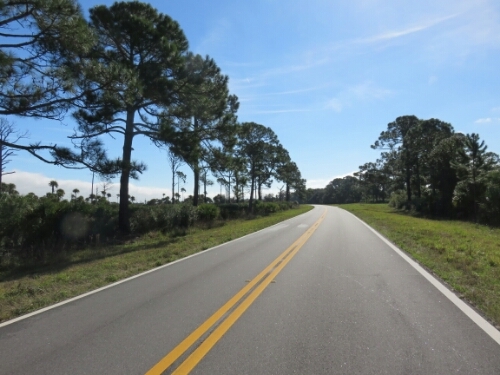 After I was all spaced out I headed back off Merritt Island for the second time and began riding my way down the coast to my destination for that day: Cocoa Beach. Here I was going to stay with Danny and Brenda. Danny was the younger brother of Rocky with whom I’d stayed in Vegas. Danny and Brenda had been looking at my blog and when they’d seen I was in Florida they kindly offered me somewhere to stay. They really made me feel at home and I had a great time with them. I even got to handle some handguns for the first time, luckily they were unloaded. 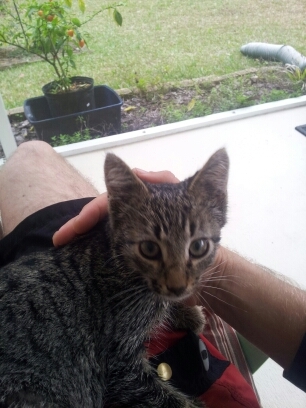 The next day I had an uneventful ride down to Vero Beach where I would be staying with the parents of a friend. Great to see you made it across the USA. what a cool trip. I bet you’re glad Florida is flat flat flat.